Children under 2 are cared for in our baby rooms. These are gentle, loving and caring environments. 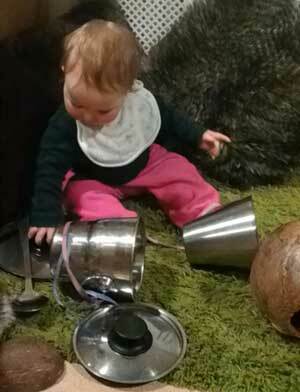 Your baby will have a variety of multi-sensory experiences to extend and develop his or her concept of the world. Our dedicated and experienced staff will meet their every need. Individual planning for each child following national guidelines helps our staff to offer a variety of experiences to stimulate and interest your baby. 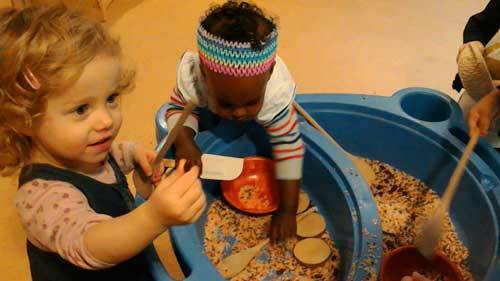 We pride ourselves on the high quality of our childcare provision with regards to care as well as early learning. For more information on the curriculum – Pre-Birth to Three: Positive Outcomes for Scotland’s Children and Families visit Education Scotland. Each of our baby suites are designed to meet the vastly changing needs of the under 2’s and offer them opportunities for physical, messy and active play indoors and out. The children are encouraged to seek their own identity and are encouraged to start on the path of independence. In Maryhill, the babies have access to 3 rooms, catering for differing stages and ability. In Cumbernauld, there is a more freeflow approach with a calming nook for babies to relax and explore their senses. Most of your baby’s care will be given by their key worker who will also develop a close relationship with you. We love to share the pleasure of watching your child develop and learn and welcome your expertise on your child’s routine. Every day your child is at Step by Step Nursery we will complete a daily diary; you will then have a permanent record of your baby’s time at nursery. We use on-line learning journals that you can access on the go and share your child's achievements at home.